Once in a while a project opportunity comes up that is just too exciting to refuse! 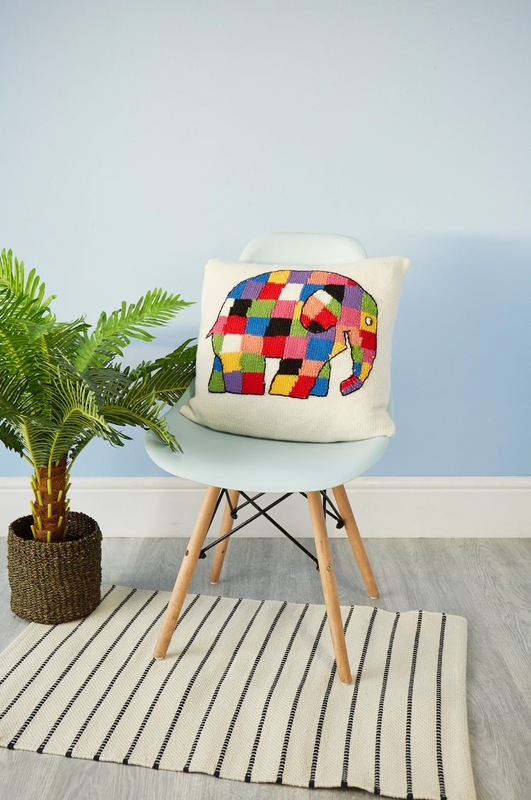 Last summer, while I was heavily pregnant, Kate from Knit Now contacted me asking if I would be interested in designing an Elmer the Elephant cushion cover. I have loved Elmer the Elephant for years: I used to read the books to my sister when she was younger, and I adored Elmer the Elephant's brightly coloured patchwork illustrations. The project wasn't ideally timed, but it really was something I really wanted to be involved with, so I said yes. I love how the cushion cover turned out: the brightly coloured patches look fantastic in the shades of Patons Extrafine Merino DK* that the pattern is designed for. Of course this is a project that uses a lot of colours in very small amounts, so you could always go stash-diving and use up lots of little leftovers if you don't fancy buying a whole ball of each colour. The cushion cover is knitted as a strip that is seamed at the end and fastened with buttons (I used a rainbow selection of buttons to tie-in with the colours in Elmer the Elephant). Elmer the Elephant is knitted into the strip using the intarsia technique. I'd encourage you to use intarsia for the project, but if you really don't enjoy intarsia, you could use duplicate stitch onto a plain background instead. The outline is adding at the end using very simple embroidery. If you want to knit your own Elmer the Elephant cushion, the pattern can be found in issue 98 of Knit Now, which is available in UK shops now. The pattern is within the main magazine, so is available even in international and digital copies. If you can't find a copy locally, why not order a print copy online, or order a digital edition? Want to add the pattern to your Ravelry queue? The Ravelry pattern page can be found here.